Yali, meaning 'duck pear', is the most famous Chinese variety, actually pear shaped with green skin. It is crisp and juicy with sweet/tart flavor and a hint of anise and spice. Yali Asian pears are great in salads, cheese plates and desserts, and are excellent for poaching. 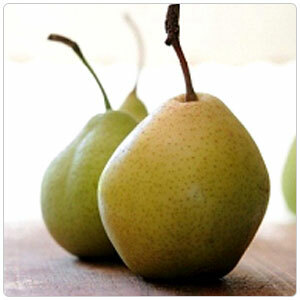 Asian pears ripen completely on the tree and are crisp and firm in texture with sweet flavor. They are often called apple pears because most Asian pear varieties are apple shaped and, when eaten, have a crunchy apple-like texture. Asian pears are native to both China and Japan. Japanese varieties have yellow-brown skin, while Chinese varieties have green-yellow skin.